From high up in Fumihiko Maki’s celebrated 4 World Trade it’s easy to see how much has changed at the World Trade Center site over those 13 years—and how much still needs to get done. Looking straight down the tower’s western edge, you can see the pools of the 9/11 Memorial Plaza which opened in 2011 and the adjacent 9/11 Memorial Museum that came on-line three years later. 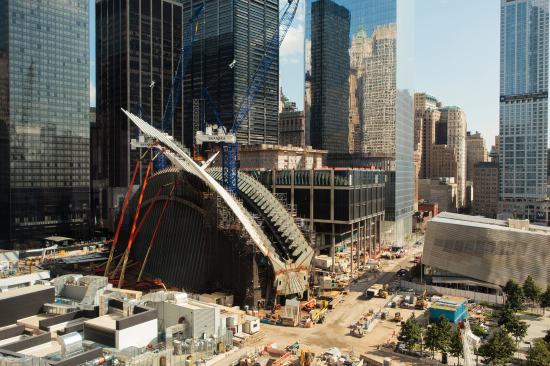 Next to that is Calatrava’s bird-like transportation hub where workers could be seen busily welding on the structure’s skeletal wings. That project is scheduled to open in the second half of 2015, years behind schedule and at a cost of nearly $4 billion. 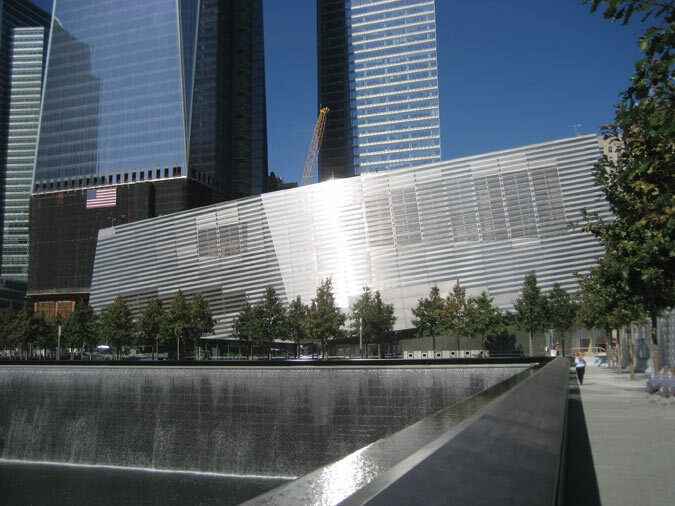 A few blocks north of the winged creature is 7 World Trade, the David Childs–designed building that opened in 2006 and is fully leased. 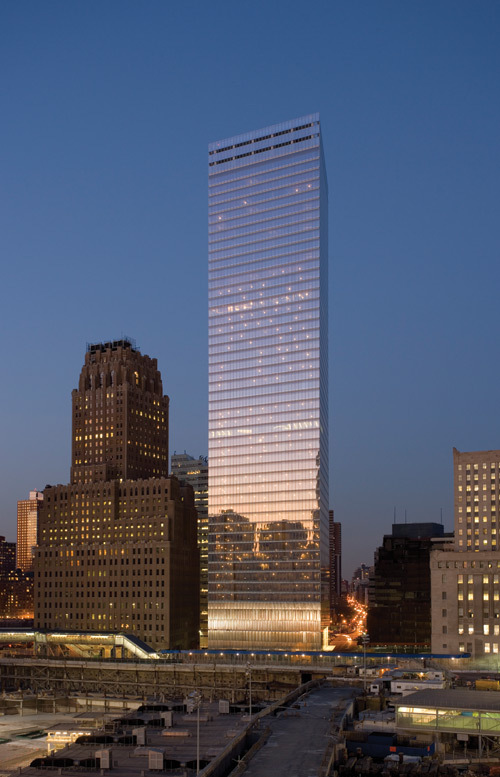 Across Vesey Street is another Child’s tower—the site’s centerpiece—the 1,776-foot-tall One World Trade. After years of delays, the building is expected to open some time this fall. As of now, the tower is about 60 percent leased. The same can be said for 4 World Trade. “I am both humbled and inspired by the process. 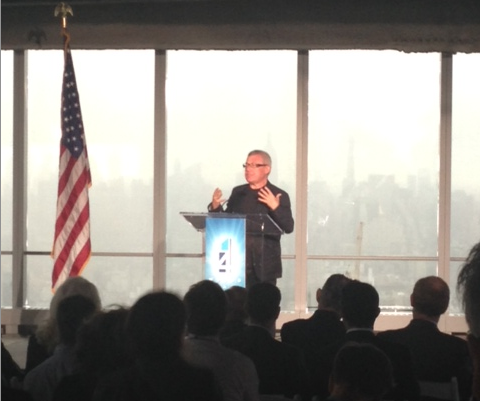 It is never an easy process, and why should it be?” asked Daniel Libeskind, who crafted the site’s masterplan. 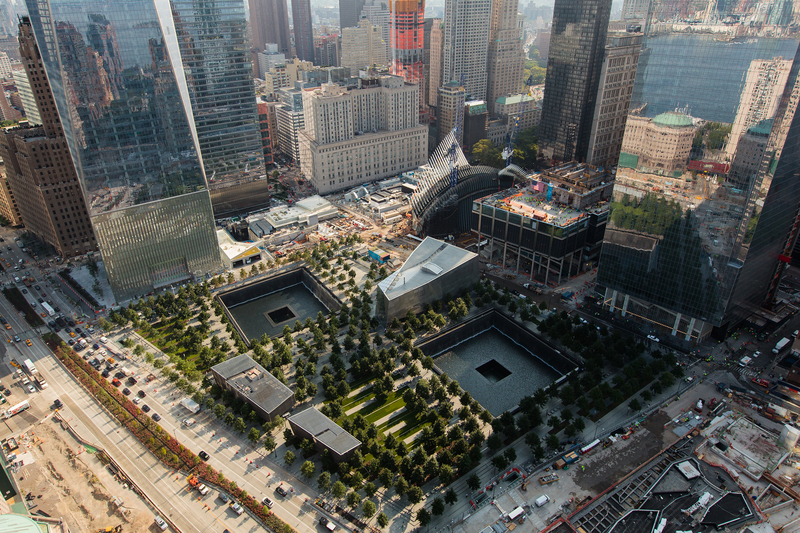 “This is New York City, there are so many stakeholders, so much to be done, and so much to think about.” But there is obviously so much more to be done still—so many missing pieces in Libeskind’s plan. Just this month, the board of the World Trade Center’s performing arts center announced it had scrapped Gehry’s decade-old design for the project. 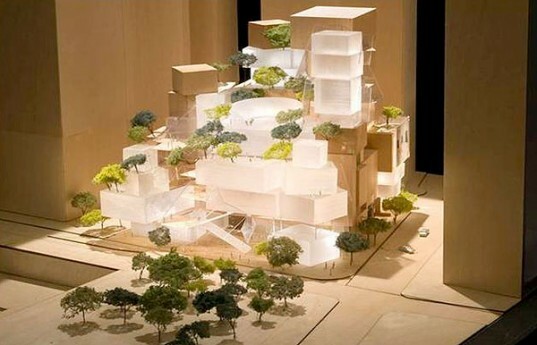 The board told the New York Times that is currently looking for a new architect to take over. And then there is Calatrava’s other project at the site, the new St. Nicholas Greek Orthodox Church, which is still a few years off. 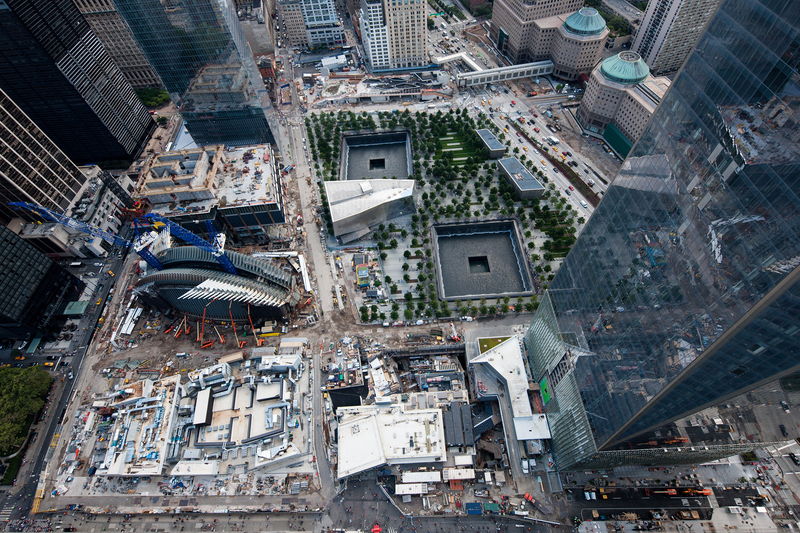 While looking straight down from 4 World Trade shows how much has been rebuilt since 9/11, looking straight out reveals how much has not. The Midtown skyline that served as a backdrop for the event’s speakers may have been impressive, but it was a blatant reminder of what has not been accomplished since the Twin Towers came crashing down. 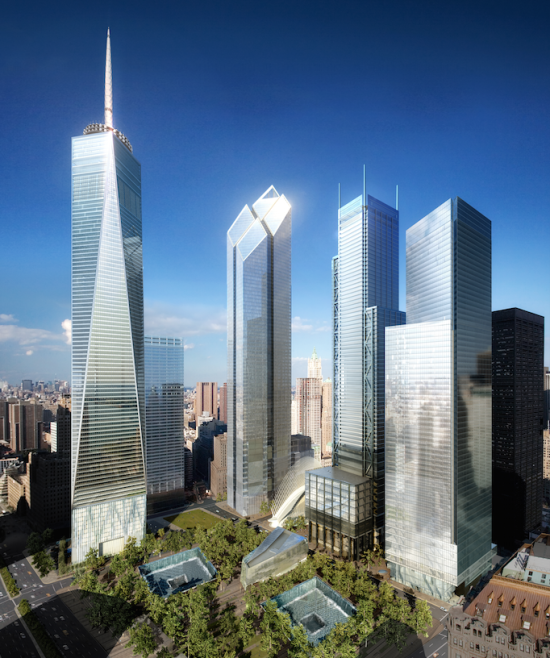 Because, at this point in the reconstruction process, employees in 4 World Trade Center shouldn’t have an entirely unobstructed view of Midtown—there should be two other glass towers in the way: 3 World Trade by Richard Rogers and 2 World Trade by Norman Foster. Silverstein said that the former should be completed by 2018, but as for 2 World Trade Center, it’s anyone’s guess. 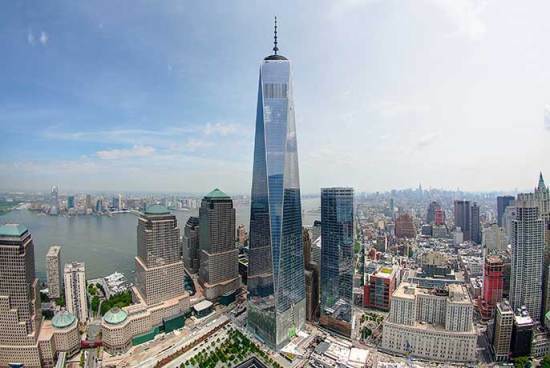 In a fact sheet distributed by representatives of Silverstein Properties, the tower’s completion date is conspicuously left off.